Nearly every manufacturers’ catalogue contains specifications of the materials entering into the construction of his machinery. This information is, in the main, accurate and instructive, but is very imperfectly understood by the majority of people who read such literature. Probably not one person in one hundred, on the average, can give anything like a definite statement concerning the properties of the ordinary materials used, and it is not likely one in a thousand knows what is meant by the term open hearth flange steel or knows the difference between open hearth steel and tool steel. It seems desirable, therefore, before taking up the details of construction of a boiler or engine, to devote some time to a consideration of the properties, and the processes of manufacture, of the common materials dealt with in everyday work. Until comparatively recent years the principal material used for boiler plate was wrought iron, but for a number of years back practically all boiler plate has been made of a soft grade of steel. Steel is manufactured principally by three distinct processes, viz., the open hearth, Bessemer, and crucible processes. A detailed account of each of these processes would be interesting, but it is a little beyond the limits of this book. Suffice it to say, however, that boiler plate is made by the open hearth process, railroad rails by the Bessemer, and steel, used for tools, by the crucible process. This gives some idea of the characteristics of the steel made by each of the different processes. The materials used in boiler and engine construction are cast iron, malleable iron, wrought iron, steel, brass, bronze and babbitt, a description of the properties of each of which is given herewith. Cast Iron — Cast iron is used for brackets, grates and engine castings (including cylinder frame and other parts which require stiffness and considerable weight). It is generally brittle and untrustworthy, being full of flaws and of uncertain texture. In tension it will stand a strain of from 15,000 to 20,000 pounds per square inch, but in compression it will stand from 80,000 to 120,000 pounds per square inch. Gray castings are made from a good grade of pig iron and are easy to machine. Ordinary castings made from scrap iron are harder to work, somewhat more brittle, and often somewhat stronger. Cast iron is apt to crack under sudden and excessive changes of temperature. It is not suitable for the shells of boilers and is not so used, except in the case of certain styles of low pressure sectional boilers used for house heating, where the pressure does not exceed ten or fifteen pounds to the square inch. Cast iron can neither be forged nor welded. Malleable Cast Iron — Malleable cast iron as the name implies, is quite soft and will stand considerable bending before breakage occurs. Malleable castings are used extensively in harvesters, mowers and in other agricultural machinery where considerable strength with light weight is desirable, and to some extent for light castings on traction engines. They are first made like ordinary castings and then packed in a substance rich in oxygen and placed in a special form of oven where they are maintained at a high temperature for several days. During this process a large amount of the carbon, always present in cast iron to the amount of five or six per cent, is either burned out or changed from the graphitic to the combined form, thus making the castings malleable. It is the presence of carbon in the form of graphite, together with the loose structure of the iron, that makes ordinary cast iron so brittle. Wrought Iron — Wrought iron differs from either cast iron, malleable iron or steel. It is tough and fibrous in structure, works readily in the forge and is easily welded. The only way to tell the difference between wrought iron and steel is by the appearance of the fracture. When wrought iron is broken the fibers are plainly visible and between them particles of an impurity called slag which has not been squeezed out in the process of working. The more wrought iron is worked under the hammer at the welding temperature, the better it becomes, because more of the slag is worked out. When steel is broken it shows a granular surface. To the experienced eye, the crystals indicate quite clearly the character of the steel. The principal use for wrought iron in traction engine construction is for reinforcing rings at the bottom of the water leg and around fire door openings. It does not crack, and resists the stresses due to extreme differences in temperature better than almost any other substance. Steel — Carbon is an essential element of steel but not of wrought iron, although wrought iron always contains more or less of this element. The effect of carbon upon steel is to make it harder, more brittle, and give it the capability of taking a temper. Since boiler plate must always be soft and ductile it is evident that it must contain a very small amount of carbon, consequently the mild steel used in boiler construction contains only from 0.15 of one per cent to 0.20 of one per cent of carbon. Machinery steel, which is the kind designated for shafting, contains about one-half per cent of carbon. Such steel will take a mild temper but does not contain enough carbon to make it brittle. Steel containing from 0.75 up to one per cent of carbon is used for making cold chisels, axes and other tools of the same general nature. The finer grade of tool steel used in making fine cutlery, razors, etc., contains from one to one and one-half per cent of carbon. Such steel is very hard and brittle and is not suitable for any other purpose than for tool making. Mild steel is worked quite readily in the forge and can be welded but not with the same ease as wrought iron. Steel or iron containing sulfur is brittle when hot and is said to be “hot short.” If phosphorus is present in an appreciable quantity it is said to be “cold short,” that is, brittle when cold; consequently, care must be taken in the manufacture of steel to keep the percentage of these two injurious elements very low. Testing Steel — The suitability of steel for boiler purposes is determined by certain chemical and physical tests which will presently be described. The chemical test is for the purpose of determining the amount of carbon, sulfur, phosphorus and other elements present, and the physical tests to determine the strength, softness, ductility, etc., of the metal. Physical tests are divided into two classes, tension tests and bending tests. The tension test is for the purpose of determining the ultimate breaking strength of the material, together with its elasticity and stretching qualities; the bending test, in order to determine its hardness, brittleness, etc. For the tension test, strips two inches wide and about eighteen inches long are cut from the plate to be tested. These test pieces are placed in a testing machine which pulls the specimen in two and registers the number of pounds of tension required on a scale beam. As the load is applied, the specimen begins to stretch and up to a certain point will return to its original length when the load is removed. This point is called the yield point or the elastic limit of the metal. The bending test required of boiler plate is that the specimen will stand bending and hammering over on itself cold without showing any cracks or flaws on the outside of the bend. It must also stand the same test after being heated to a cherry red and quenched in cold water. Boiler Steel Specifications — Four grades of steel are used for boiler purposes, viz., extra soft steel, fire box steel, flange steel and rivet steel. Extra Soft Steel — Extra soft steel should stand a breaking strain of from 45,000 to 55,000 pounds per square inch and show an elastic limit of one-half this amount. It should also show an elongation or stretch of twenty-eight per cent in a length of eight inches before breaking. It must also stand both bending tests above described and contain not to exceed 0.04 per cent of either sulfur or phosphorus. Fire Box Steel — Fire box steel must show an ultimate tensile strength of from 52,000 to 62,000 pounds per square inch, an elastic limit of one-half this amount and an elongation of twenty-six per cent in eight inches. The tests for bending, for sulfur and for phosphorus are the same as above. Flange Steel — Flange steel must show the same ultimate strength and elastic limit as fire box steel, but the required elongation in a length of eight inches is only twenty-five per cent. The amount of phosphorus allowable is somewhat higher, being 0.06 per cent, and of sulfur 0.04. The bending tests are the same as those above specified. Rivet Steel — Rivet steel must have the same properties as those specified for extra soft steel. Metals for Boxes — Bearings for journals are made of some soft material if the shaft is of any considerable size. The bearing materials in common use are babbitt, brass, bronze and phosphor bronze. In light, delicate machinery, where friction must be reduced to a minimum, very true hard bearings and journals are used, as for example, the jeweled bearings in watches. In ordinary machinery such bearings would not give good satisfaction for several reasons. They would have to be made perfectly true and would hence be very expensive. They would be more easily broken and more difficult to repair, while with ordinary steel shafting and soft boxes all these difficulties are obviated. A good bearing for farm machinery should be easy to repair or renew in the field at slight expense. It should also wear well and sustain the heaviest loads without heating. All bearings, it is true, heat some, and after running for a time will feel quite warm to the hand, but after that the temperature should not increase appreciably in a well made, well designed bearing. The metal for a bearing should be an alloy composed of two or more metals, one rather hard and yielding, the other somewhat soft and springy. The object of the softer metal is to form an elastic support for the hard metal which really forms the true bearing. As noted above, the harder the metal the less the friction, provided the fitting is done with absolute accuracy; but since hard metals will not conform to the shape of the journal a springy support is necessary, otherwise the load will be concentrated upon a few high places and produce rapid abrasion and heating. There are five metals used in making bearings, viz., copper, tin, lead, zinc and antimony. All babbitts, brasses and bronzes are made up of two or more of these metals, with occasionally a small quantity of some other metal. All alloys of copper and tin were formerly called bronzes, while all alloys of copper and zinc were known as brasses. At the present time there is no sharp line of difference between the two, since nearly all alloys contain not only tin, but lead and zinc also. Phosphor-bronze contains about eighty-nine per cent of copper, ten per cent of tin and one part of phosphorus. The object of the phosphorus is to make the bronze harder and tougher. It is perhaps a little better bearing metal than ordinary brass. Ordinary brass contains about 84.3 per cent copper, 10.5 per cent of tin and 5.2 per cent of zinc. Brasses and bronzes, when used as bearings, reduce the amount of heating and show a little less friction than babbitt, but the difference is only small at best. Babbitt is very much cheaper in first cost and can be repaired so easily in the field that it ranks high as a material for bearings in farm machinery. Babbitt — Genuine babbitt contains 3.7 per cent copper, 89.1 per cent tin and 10 per cent of antimony. The large amount of tin makes it rather expensive so that very little genuine babbitt is used for bearing purposes, Cheaper babbitt containing lead with small amounts of tin and antimony are more commonly used. A fairly good babbitt is made up of twenty parts tin, seventy parts lead and ten parts of antimony. It is not quite as good a bearing material as the genuine babbitt but costs only a fraction as much, since lead, which is the base of the alloy, is quite cheap. Most of the anti-friction metals advertised widely as the “best on earth,” etc., are in reality cheap babbitts, composed largely of lead but sold at a fancy price. Babbitt is very easy to adulterate and hard to judge. The only way to secure a good babbitt is to buy from a reputable dealer and depend upon his word for the quality of the material purchased. Flues — The flues are made of wrought iron or mild steel and are either lap welded or solid drawn. The steel tubes used for traction engine work are seamless, i.e., drawn and formed to the proper size and shape without being welded. Wrought iron tubes are made of a specially soft grade of iron and are welded over a mandrel. In general, steel tubes are truer to size and shape and smoother than iron, and as made at the present time are very satisfactory for traction engine work. All boiler tubes are supposed to stand a water test of five hundred pounds per square inch internal pressure and a section cut from the tube must stand hammering down cold, vertically, without splitting or showing any cracks or flaws. The length of these test sections vary for the different sizes of tubes, the sections being one inch long for tubes from two to two and one-half inches in diameter. The thickness of boiler tubes is expressed by the numbers of the Birmingham Wire Gauge; 12 gauge is the standard for tubes between two and two and one-half inches in diameter, although some manufacturers claim to use 11 gauge for tubes of this size, which is a little thicker. Flues are measured externally, i.e., a two-inch flue is two inches in diameter on the outside. Steam, gas, and water pipes, on the contrary, are measured internally; for example, a two-inch steam pipe is two inches in diameter on the inside. The Arrangement of Flues — The arrangement of flues in a boiler is an important matter and in past years some mistakes have been made by manufacturers in arrangement. 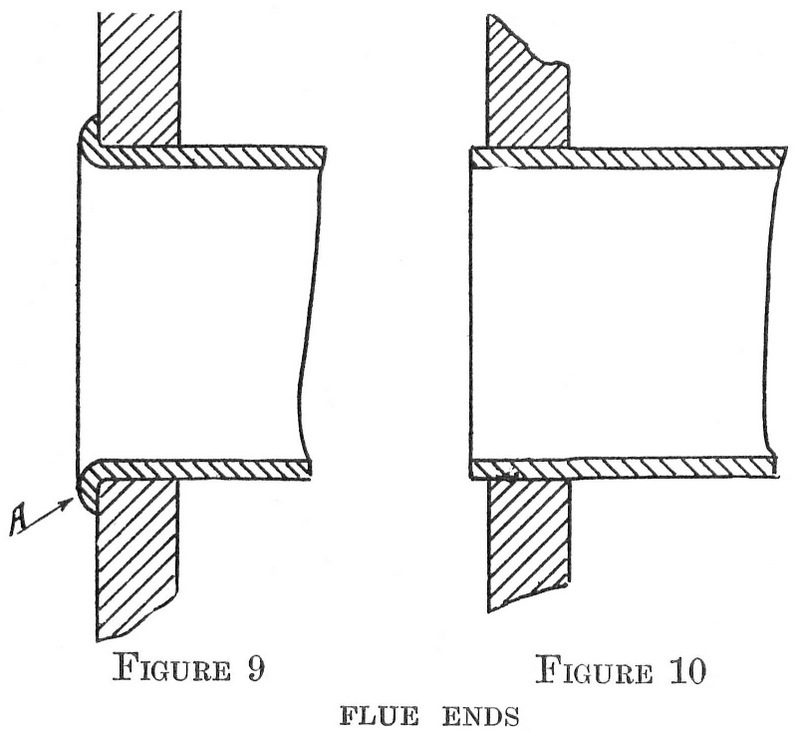 At the present time, so far as known, the arrangement of flues in direct flue boilers is in both horizontal and vertical courses, as shown in Figure 7. 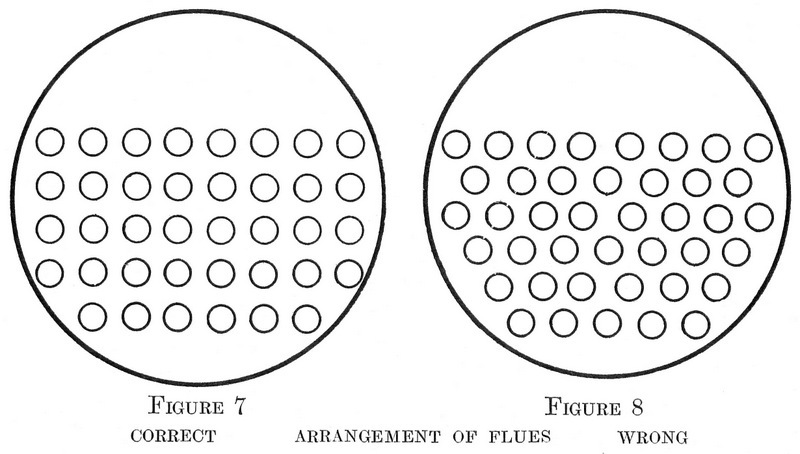 This arrangement is much better than shown in Figure 8, in which the flues are staggered in vertical rows. Such an arrangement impedes the circulation and does not allow the scale to drop to the bottom, while at the same time such arrangement makes the boiler very difficult to clean. It is just as essential to have good circulation in a boiler, so far as steaming qualities go, as it is to have plenty of heating surface; in fact, this is another principle in correct design. Flues are secured in the flue sheets by being expanded at the ends and then beaded over at both ends, or else by being simply expanded at one end and expanded and beaded at the other. Figure 9 shows a tube expanded and beaded and Figure 10 a tube simply expanded. Both methods are in common use and have been for a good many years and both have proven satisfactory in practice. Tests made on the holding power of beaded flues and flues that are simply expanded in the flue sheets show about the same results. It would seem as though the beaded flue ought to hold a good deal more, but the tests show very little difference. Where flues are beaded care must be taken to make the bead, especially in the firebox end, as small as possible. 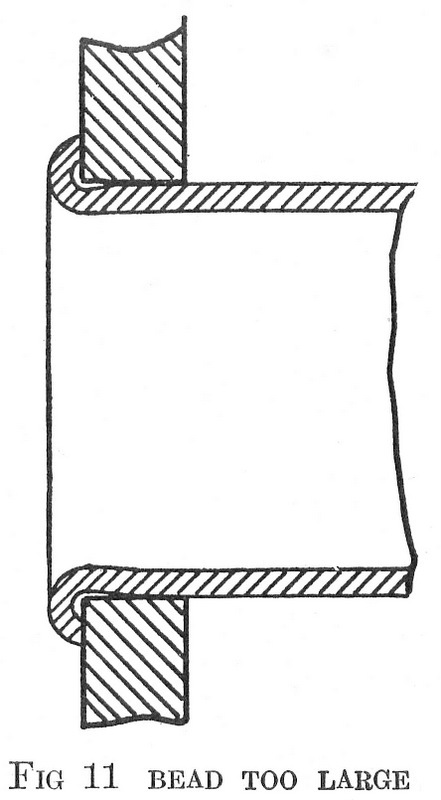 If it is made large it is almost sure to be poorly formed, thus making a poor joint between the flue and flue sheet, as shown in Figure 11. Or even if well formed, the large mass of metal in a big bead, being so far away from the water, does not conduct the heat rapidly to the water and, hence, is pretty sure to become burned before it has been long in use. Quite a good deal of the difficulty experienced with leaky flues arises from just this cause. A great many manufacturers, both of traction engines and locomotives, place a copper ferrule between the tube and tube sheet in the fire box end. When the tube is expanded, the copper being much softer, fills whatever little inequalities there are between the two surfaces and thus makes a tight joint. Furthermore, since copper expands very much more than iron for the same increase in temperature, it follows that the joint will be tighter when the boiler is steamed up than when cold. This is the reason why boiler tubes will sometimes leak when cold and be perfectly tight after the boiler is steamed up. The one objection to the use of copper ferrules is the fact that the alternate contraction and expansion of the metal finally presses the copper out of shape and makes a leaky joint. Where the holes for the tubes are reamed perfectly true and the flue is turned to a perfect fit, so that bright surfaces come in contact, a very satisfactory joint can be made without the use of copper, but however made there is bound to be more or less difficulty with leaky flues, due to the fact that they are made of thinner material than the flue sheets and consequently expand and contract rapidly with sudden changes in temperature. Whenever the fire door is opened and cold air is allowed to pass through the flues there is a very great drop in temperature, probably of anywhere from 500 to 1,000 degrees, which causes the flue to shrink. Care should be taken, then, to keep the fire door closed while the engine is running and in every way possible to prevent any sudden changes in temperature. Figures 12, 13 and 14 represent the tools used for putting in flues. 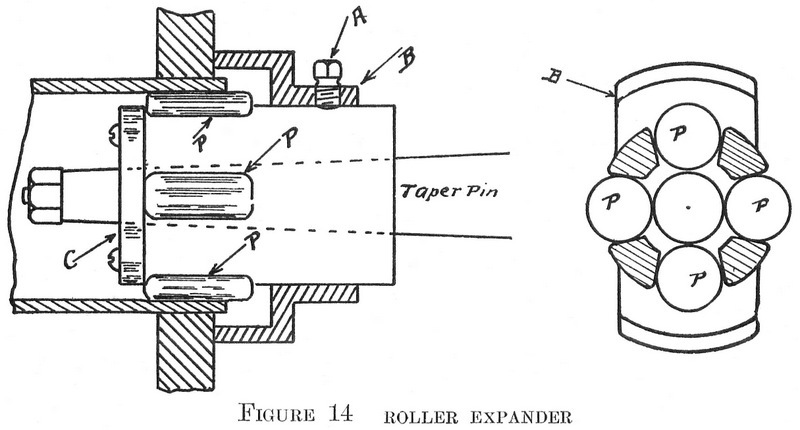 Figure 12 is a beading tool, 13 a spring expander, and 14 a roller expander. Every engineer ought to have a beading tool, which any good blacksmith can make, in his tool box. In making this, care should be taken to make the radius of curvature at A of the right size, because the size of the bead on the tubes will be dependent upon the size of this curve. Either one of the expanders will do good work. For repair work, where the holes in the flue sheet may be slightly out of round, the spring expender will probably do the better work; for new work, the roller expander is very satisfactory. In putting in flues care should be taken, first to anneal the ends, which can be done by heating them to a bright cherry red and then allowing them to cool in slaked lime, dry ashes or dry sand. They should be cut off square on the ends, preferably in lathe, and an allowance provided of between one-eighth and three-sixteenths of an inch at each end for beading or for projection if they are not beaded. After the tubes are in position the expander is driven in fairly tight, the taper pin is then jarred loose, the pin turned slightly, then driven in again, and this operation repeated until a tight joint is secured between the tube and tube sheet. Care should be taken not to drive the expander in too tightly, as by so doing the flue may split or the adjacent flues be caused to leak, due to a deformation of the tube sheet. The work done by the spring expander whose operation has just been described is shown in Figure 15. The convex portion at A forms the groove shown at B in the figure. After the tubes are expanded the bead is generally started with the ball-peen of a machinist’s hammer and then finished up by means of the beading tool. In using this, care should be taken that the sharp edge does not gouge into the tube sheet. Leaky flues can be cured sometimes by simply using the beading tool, and almost always by using the expander. Calking — Boilers have to be calked at the joints in order to make them steam and water tight. The operation is a very simple one and can be performed by almost anybody. It consists simply in driving the edge of the upper sheet down tightly upon the lower one. 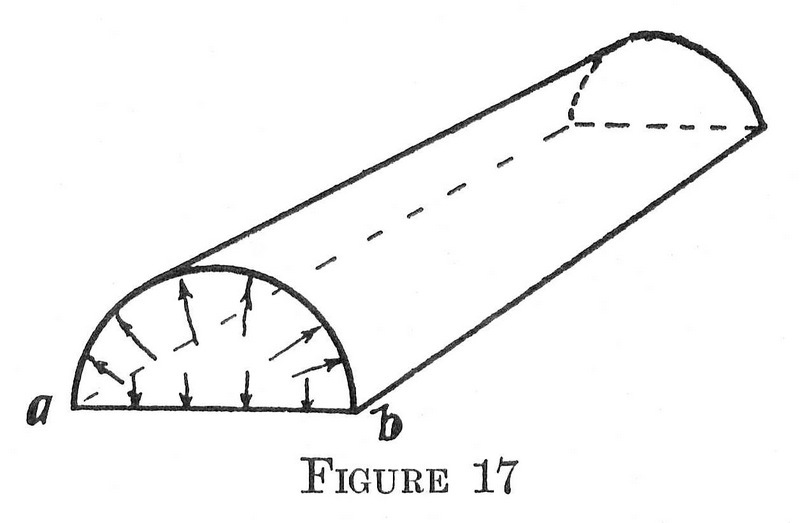 A rather heavy hammer is used for this purpose and a tool having rounded edges, whose appearance and method of operation is shown in Figure 16. If a boiler leaks around a rivet head or at a seam it can generally be repaired in a few minutes time by the use of the calking tool. It is not safe to caulk a boiler under steam pressure and it is also dangerous to use a wrench on any bolts or fittings that are screwed into any of the sheets or the boiler when it is under pressure. While the boiler may not explode, any of these parts may break off and cause a sudden rush of steam that is apt to scald the man who is doing the work, and everybody knows that a steam scald is a mighty bad one and something it does not pay to take chances with. Exhaust Nozzles — There is nothing more important about a traction engine boiler or a locomotive than the exhaust nozzle, for upon its construction and proper adjustment depends the draft and consequently the steaming ability of the boiler. The ordinary exhaust nozzle consists of a special form of elbow fitted to the end of the exhaust pipe in such a way as to point exactly up the center of the chimney. The upper end of this elbow is provided with a bushing having an opening of the proper size for the fuel which is being burned. Different sorts of fuel require different intensities of draft and so it is essential to have different sized exhaust nozzles. For example, straw requires a small nozzle, because it requires a heavy draft; wood, a larger nozzle, and coal, which burns with less draft, requires the largest. It is always advisable to use the largest nozzle which will furnish the requisite amount of draft, because any reduction in the size of the opening through which the exhaust must pass causes back pressure on the engine, which subtracts an equal amount from the working pressure. The action of the exhaust nozzle is very simple. The rapid upward flow of steam at the base of the chimney creates a partial vacuum at that point which in turn causes some vacuum in the smoke box and in the upper part of the chimney, thus inducing a current of air to pass through the furnace and flues. If the exhaust nozzle is not pointed directly up the center of the stack the stream of steam will strike the side of the chimney and part of it will be deflected back toward the smoke-box, thus destroying the vacuum and greatly impairing the draft. If a boiler does not steam well, one of the first things to do is to examine the exhaust nozzle and see if the proper bushing is put in for the kind of fuel used, and see that there is no lime or scale in the top of the nozzle, and make certain that it points directly up the center of the chimney. Many boilers have been condemned for not steaming well simply because the exhaust nozzle was not properly adjusted. Most of us have seen formulas in text books for finding the safe working pressure in cylindrical boilers, and we may have wondered where they came from and how they were obtained. It may therefore interest some of the readers to work out one of these formulas from the beginning. In the first place, we will consider a cylindrical boiler, made up without joints or seams, that is, with the joints welded together making a seamless tube, and with the heads welded in place also. If such a boiler should burst, it is easy to show that it would be more apt to split along the side than to blow the head off. We will suppose the whole boiler to be made of soft steel having a tensile strength of sixty thousand pounds per square inch. Which means that if we had a piece of such steel, one inch square, it would require a force of sixty thousand pounds to pull it apart. Example — Suppose we have a boiler 96 inches long, 30 inches in diameter and made of steel ¼ inch thick. If this boiler is under steam pressure, it is a well known fact that the pressure acts in every direction from the center outward, and its tendency is to separate the shell into two parts. The total force tending to pull the two halves apart will be equal to the force exerted on the flat plate a-b of Figure 17, because the force acting upward on the curved upper half must exactly equal the pressure on the flat plate, otherwise the boiler would move, which of course it will not do. The total downward pressure on the flat plate can be easily figured. The area of this plate is 30×96=2,880 square inches. If the steam pressure is 100 pounds per square inch, the total pressure on the plate is 2,880×100=288,000 pounds. The metal holding this plate to the upper half is the metal along the edges a-and-b. In order for the plate to separate from the curved part the metal must tear apart at a-and-b throughout the entire length of the shell. The area of this metal is 2×¼×96=48 square inches. Under the given conditions 48 square inches support 288,000 pounds, consequently each square inch is subjected to 288,000÷748= 6,000 pounds per square inch, or just one-tenth of what it would require to tear the metal apart. If each square inch of metal were subjected to 60,000 pounds the total force acting on the flat plate would be 60,000×48=2,880,000 pounds, and since the area of the plate is 2,880 square inches the pressure within the boiler to cause the rupture would be 2,880,000÷2,880=1,000 pounds per square inch. We can now proceed to find a formula for finding the bursting pressure of any boiler. But since the Z appears both in the numerator and in the denominator it cancels out and our formula reduces to a simpler form as follows. This, remember, represents the bursting pressure, theoretically, of a boiler without seams or joints. Since it is usual to put in a factor of safety to find the safe working pressure we will use the factor 5, or in other words, divide the result obtained from the above formula by 5. The result obtained in using the formula for example given was 1,000 pounds, which divided by 5 gives us 200 as the safe working pressure for a boiler without joints or seams. (60,000×2×¼×70)÷(5×30×100)=140 pounds (per square inch) safe working pressure. (60,000×2×¼×70)÷(5×40×100)=105 pounds (per square inch) safe working pressure. This shows that if we increase the diameter of the boiler it will not stand so much steam pressure, unless we increase the thickness of the boiler plate a corresponding amount. In other words, the larger the diameter of the boiler the weaker it is, with the same thickness of plate. In the fore part of this lesson it was shown that, with 100 pounds (per square inch) pressure in the boiler, each square inch of metal along a side seam was subjected to a stress of 6,000 pounds. We will now consider the stress on a circumferential seam, that is, to prevent one of the heads from blowing out. The area of a 30-inch boiler head is 3.1416×15×15=706.86 square inches. If the pressure is 100 pounds per square inch the total pressure on the head is 706.86×100=70,686 pounds. In order for the head to blow off it must tear the metal all around the boiler. The length of this strip of metal is equal to the circumference of the boiler, or 3.1416×30=94.248 inches. Its thickness is ¼ of an inch, and the area of the metal that must be ruptured is 94.248×¼=23.562 square inches. Dividing 70,686 by 23.562 we obtain the quotient 3,000 which represents the stress on each square inch of metal on a transverse seam, but this is only one-half what it is along a side seam; thus showing that a boiler is much more apt to fail by splitting along the side than it is to blow the end out. This also explains why side seams are double riveted and transverse seams single riveted. Nothing has been said yet about the safe working pressure on flat plates, or on stay bolts and braces. These require separate treatment. The formulas deduced for safe working pressure are only applicable to a cylindrical boiler shell with a double riveted side seam. Expressing this in words we may write the following rules. Rule I — Multiply twice the thickness of the boiler plate expressed in inches by the ultimate tensile strength of the plate and this product by the efficiency of the joint in per cent. Divide this product by five hundred times the diameter of the boiler and the result is the safe working pressure for a new boiler. There are a number of other rules that are sometimes applied to boilers, but all are based on some such considerations as those already discussed. The rule below is known as the United States rule, or, more strictly speaking, it is the rule prescribed by the Board of Supervising Inspectors of steam vessels. Rule II — Multiply the thickness of the shell and the ultimate tensile strength and divide by six times the radius of the boiler. Kent in his “Mechanical Engineer’s Pocket Book” gives another rule that is much more simple than either of the others but it gives results that are rather low. Kent’s Rule — Multiply the constant number 14,000 by the thickness of the plate and divide by the diameter of the boiler in inches. Applying these various rules to the same problem will give results that vary quite widely, depending upon the factor of safety that the investigators decided upon in working out the results. These rules are applicable only to boilers and can not be used in figuring the safe working pressure of boilers that have flat surfaces, because the stresses on flat plates are different from what they are on plates that are curved. The tendency of pressure on the inside of any structure is to form that structure into the shape of a sphere. If the walls of the structure are flat they are subjected to a cross bending strain as well as a tensile strain. 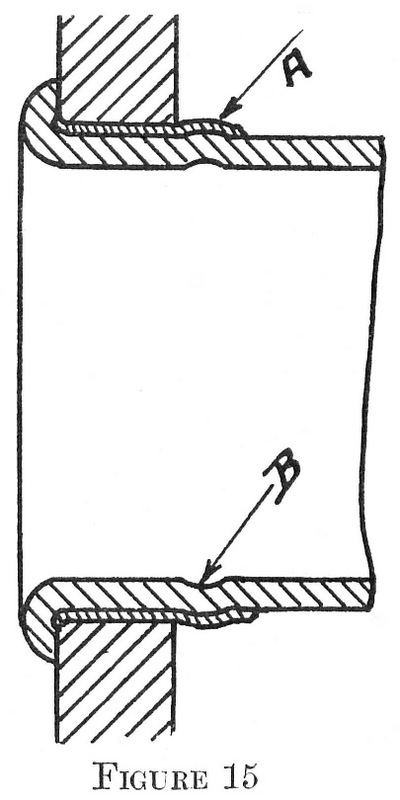 A flat plate in a boiler must be treated as a beam under a uniform load, and supported at the ends. A complete discussion of this problem is outside of the scope of this book, but we will consider the rules used in figuring such plates and work out a problem. Rule III — Multiply the square of the thickness of the plate, in sixteenths of an inch, by 112 and divide this product by the square of the distance from center to center of the stay bolts. The result will be the allowable working pressure for plates seven-sixteenths of an inch and under. If the plates are more than seven-sixteenths of an inch thick use 120 in the place of 112. Problem — What is the safe working pressure on a fire box boiler having fire box walls three-eighths of an inch thick and the stay bolts placed five inches apart each way? Solution: (6×6×112)÷(5×5)=161 pounds (per square inch) — answer. 3/8=6÷16, hence 6 in the formula. In applying this rule to a fire box boiler the strength of the cylindrical shell and of the fire box should be worked out as separate problems and the smaller of the two results taken as the safe working pressure of the entire boiler. In return flue boilers where the main flue is very large it may be necessary to figure the strength of the flue to resist crushing, since it is weaker in that way than in any other. Rule IV — Multiply the square of the thickness of the plate by 89,000 and divide the product by the product of the length of the section and the diameter of the flue. Problem — Find the safe working pressure for a flue 36 inches in diameter with walls 0.375 inch thick. Length of flue 6 feet. Solution: (0.375×0.375×89,000)÷(6×36)=60 pounds (per square inch) — nearly — answer. A tube subjected to external pressure is not as strong as if it were subjected to internal force. Where the flues are made very large as in some styles of stationary boilers it is customary to reinforce them with transverse ribs or flanges placed a short distance apart along the entire length of the flue. The allowable working pressure on stay bolts is limited to 6,000 pounds per square inch, which gives a factor of safety of about seven for wrought iron and of more than eight for steel. For example, let us figure the size of a stay bolt that is placed in rows five inches apart both ways in a boiler that carries a steam pressure of 150 pounds per square inch. Solution — If the stay bolts are five inches apart each way then each bolt must support 5×5 or 25 square inches. With one hundred fifty pounds on each square inch the total pressure on each bolt will be 150×25, which equals 3,750 pounds (per square inch). Since a square inch will support 6,000 pounds it follows that the area of the bolt needed will be 3,750 divided by 6,000 or 0.625 inch. The diameter of a bolt of this area can be found by dividing by 0.7854 and then extracting the square root of the quotient. Performing this operation we find the diameter of the required bolt to be 0.89 of an inch, which is a little more than seven-eighths of an inch. The proper size to use, therefore, would be the next size larger or a fifteen-sixteenths inch bolt. In figuring through stays to support the tube sheets above the tubes the same discussion will apply. While the rules that have already been given are in general use and give fairly satisfactory results, it is true, nevertheless, that they apply only to new boilers. There are no rules yet devised that apply to old boilers and neither can there be. Where the boiler is old, all that can be done is to give it a cold water test and depend upon the judgment of the inspector as to the proper pressure the boiler is able to stand safely. The question thus resolves itself into one of the personal judgment of the inspector. While this is not entirely satisfactory, it is probably the best that can be done.